Need comfort food? 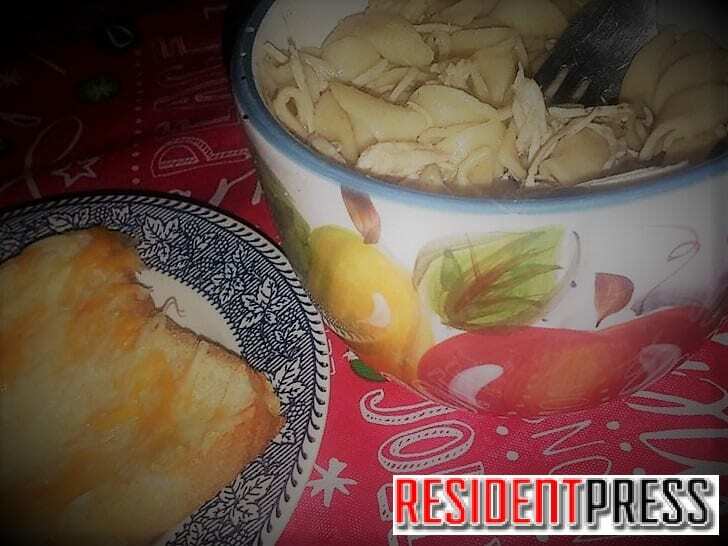 Try this Homemade Chicken Noodle Soup Recipe! With the cold weather and flu season going around, this is typically the time of year most of us stock up on Vick’s Vapor Rub, Sprite, and cans of chicken noodle soup because that’s what our Mommas taught us to do. However, when it snows, its seems I can’t help but to make a big pot of Homemade Chicken Noodle Soup even if I’m not under the weather. It’s been the tradition. If there is snow on the ground, then there is Chicken Noodle Soup on the stove. Usually, while my kids play in the snow, I’m busy cooking in the kitchen. When they come in shivering and ready to unthaw, I have a bowl of chicken noodle soup with a side of cheese toast to warm their tummies. Look below for my recipe! Clean and rinse chicken breasts. In a large pot, submerse chicken breasts in water. Boil chicken on high until completely cooked. This takes about 45 minutes to fully cook the chicken. Debone and shred chicken into small chunks of meat. In another pot, place noodles on to boil according to directions on the package. Once the noodles are finished cooking, drain excess water off of the noodles. Before returning noodles to the pot, add the 48 oz box of Chicken Broth and two cups of chicken broth from the water the chicken was boiled in. Next, add the bullion cubes and stir on medium low heat until they are dissolved into the broth. Now, add the noodles to the pot and chunks of chicken. Stir noodles and chicken. Add all spices and stir once more. Now, add the carrots and mix well within the soup. Last, add the butter stirring lightly until melted within the soup. Place soup on low and cover. Simmer soup for an hour to let spices soak into the soup. Stir occasionally during that hour to prevent sticking. Then, enjoy with cheese toast! Next Next post: Lavaca’s Hope Headley Named to the West All-Star Team!